According to a legend once Emperor Jahangir called upon his cook Adil hafiz Usman, and asked him to come up with a new kind of paratha, since he got bored of eating the same simple paratha with mince (qeema) every day. One the ninth day the cook came up with a new innovation in Paratha, Zabir Fala or Anda roti, which was later known to be famously as Mughlai Paratha. Jahangir was so delighted with his cook that he gifted him 1001 gold coins and a land in west Bengal. So the forefather of modern paratha came into being. Just imagine 1001 gold coins for a simple paratha in the 16th century, what if he lives for today seeing such variety of innovative parathas especially here at Karachi. This unleavened flatbread originated in the Northern Indian Subcontinent. It is a very popular meal in Pakistani households. This dish has travelled to many parts of the world, including USA, Europe, Canada, Singapore and Malaysia. In Trinidad and Tobago, it differs from the South Asian version which is generally larger in size and thinner in density. For centuries observed as the traditional breakfast, parathas were eaten mostly in the mornings. 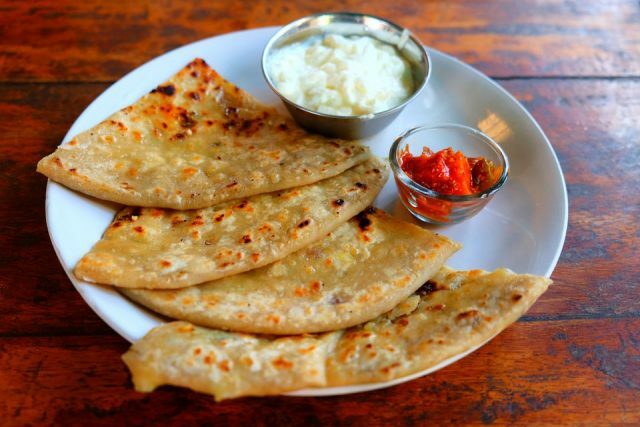 Traditionally, parathas are made either plain, or they can be stuffed with some kind of cooked vegetables, but as times haves changed people can enjoy it whenever they feel like having a paratha. Another convenience modern living has introduced are frozen parathas that can be bought from supermarkets, prepared ready to be fried. Certainly popular among those who can’t cook parathas in traditional style or say like students or bachelors. It’s time saving for sure, but nothing can beat the delightful tempting aroma of nicely cooked, crispy parathas. There are many places famous for the traditional parathas they are offering for ages to the local customers. Almost every locality of the Karachi has its own famous chai paratha dhaba. The traditional recipes I guess are same all across, but the innovative parathas which have become a tempting trend recently are worth trying form desi taste to innovative chocolate parathas what’s not included on the menu. Long gone are the days of traditional parathas that included allo, bessan, qeema or moli or the home made local flavors. You can try various varieties of parathas like pizza, cheese, barbeque, fajita, Arabic or chocolate parathas; all are famous trending varieties of stuffed parathas. Ever heard of Dulhan paratha literally meaning bride paratha? I did and tried. A few days ago I came across a place in Gulshan e Iqbal, called Abid Town, named Sufina chai and how we ended up there is another story, getting back to Parathas, on its menu was a specialty called Dulhan Paratha so we ordered it. Sometimes name of the food shout out loudly to be tried. It was an average size paratha, stuffed with chicken mince definitely with some spices and topped with mozzarella cheese and vegetables. I guess it got its name because of being laden with various stuff like our traditional brides. Flavor was good, the cheese would have melted if was given a few more minutes over the heat. Total price for two parathas was Rs 300. On the contrary, there is another local specialty with a unique name Goli Paratha or Bullet paratha. Off course recipe doesn’t include for the original bullets, maybe it’s the impact of the area from where it gets its name from, the word Goli adds some local flavor. Located in the Ali Mohammad Mohala of Lyari, Haji sahib’s Malbari Café, also known as Joona Masjid hotel. It was explained by a regular customer that the Goli or bullet is actually a tikya (bar) of butter, which is slid inside paratha before it is shredded. People start lining up outside the cafe an hour before morning prayers for their share of the cafe’s famous Goli paratha and daal makhni. 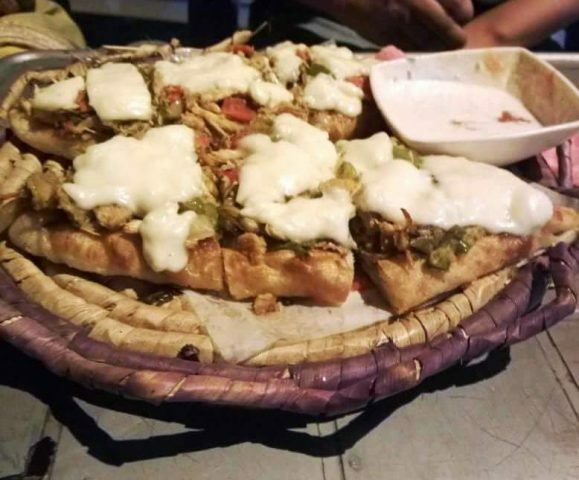 The recent boom in café and Dhaba culture has played the definitive role in bringing new varieties of food to Karachitis. Not just the names of these eateries are mind blowing, but some are also putting very unique and tempting names for food. It is best to seek to prepare a meal somehow so it boosts your state of health. An individual’s body can easily make the most of its capability to mend by just changing your dangerous diet routine. Shedding pounds is actually difficult if you’ve complaints about the metabolic processes. There’s a website on the topic which you really need to take a look at. shapingrecipes.com/metabolic-cooking/ . I feel you don’t have anything to lose simply by looking over it.